The Eve Room is the second generation of Eve Systems’ popular indoor air-quality monitor. This version of the HomeKit-enabled accessory provides most of the same capabilities as the earlier model but in a radically different–and much more appealing–modern design. Gone is the bland, utilitarian white box. This Eve Room has the same 2-by-2-by-0.5-inch dimensions as the Eve Button we reviewed a while back, with the identical Apple-esque finish of silver-aluminum and glossy black. It also adds a 200-by-200 pixel e-ink display that lets you see the current temperature, humidity, and air quality reading without having to pull out your phone. The power source has also been upgraded, trading the earlier iterations AA batteries, for a rechargeable lithium ion battery. It’s rated to run for six weeks, after which it will run on low-power mode, displaying only temperature and humidity, until it’s recharged. The second-generation Eve Room sports a new display and an Apple-style finish. 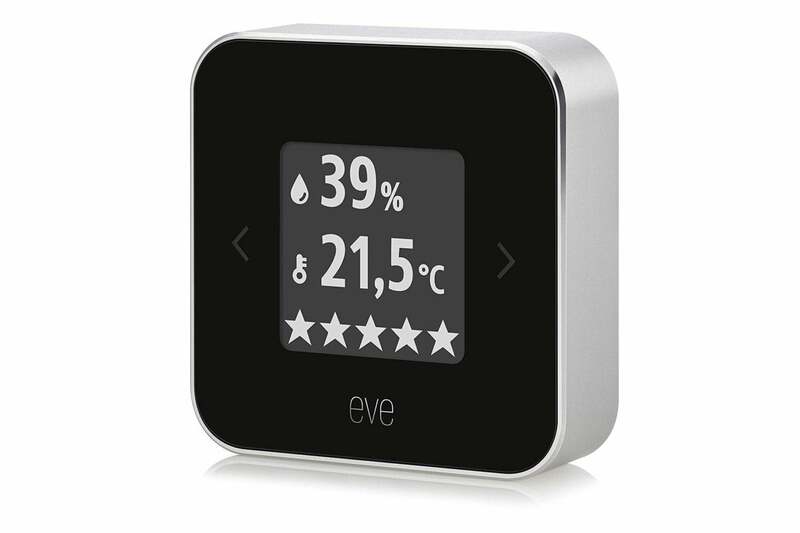 You can use the Eve Room without any apps; once you charge it up, it displays the current room temperature, indoor humidity, and an air-quality rating shown as a five-star scale. You can toggle through views that display one reading more prominently than the others by tapping the arrows on either side of the display. The readings are bright and easy to read, and the e-ink display doesn’t produce glare in sun- or artificial light. You can pair the device and assign it to a room after scanning its HomeKit QR code, using either the iOS Home app or the Eve companion app. I used the first option and the Room was connected within seconds. The Room displays in the Home app as three separate accessories, one for each reading. These provide the same details as the device’s display, though the air quality here is rated from “poor” to “excellent,” rather than on the five-star scale. Provided you have a HomeKit-enabled hub set up, you can use any of the Room’s readings to trigger an automation—adjusting your smart thermostat when the temperature rises or falls from the desired level, for example, or turning on an air purifier when the air quality deteriorates. You can track and compare air quality readings over time in the Eve companion app. The Eve app provides more detail and functionality than Apple’s Home app, but the main reason to use it is to view historical air quality data. The Room collects measurements over time, and the Eve app can display these in graph or list form for tracking and comparison. The app also allows you to configure settings and share data, and is just a far more elegant way to interact with the device. The Eve Room does what it does well. But, barring an ability to detect hazards like radon or carbon monoxide, consumer air-quality monitors are really instruments of comfort more than health. That puts them squarely in the “useful, but not essential” category. The Eve Room, then, can be considered a splurge at $99.95, but one that might be worth it if you’re looking to expand your HomeKit ecosystem. Will going online save the sari weavers?